A Journey Among the Christians of the Middle East. In the spring of A.D. 587, two monks set off on an extraordinary journey that would take them in an arc across the entire Byzantine world, from the shores of the Bosphorus to the sand dunes of Egypt. On the way, John Moschos and his pupil Sophronius the Sophist stayed in caves, monasteries, and remote hermitages, collecting the wisdom of the stylites and the desert fathers before their fragile world finally shattered under the great eruption of Islam. More than a thousand years later, using Moschos's writings as his guide and inspiration, William Dalrymple sets off to retrace their footsteps. Despite centuries of isolation, a surprising number of the monasteries and churches visited by the two monks still survive today, surrounded by often hostile populations. Dalrymple's pilgrimage takes him through a bloody civil war in eastern Turkey, the ruins of Beirut, the vicious tensions of the West Bank, and a Fundamentalist uprising in southern Egypt. 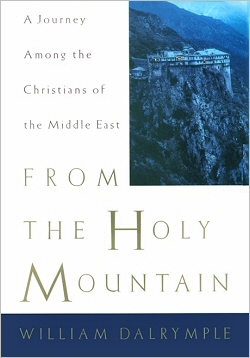 As a writer and as a traveler, Dalrymple treads the now-faint trail marked out by sixth-century monk John Moschos, who wandered the world of Eastern Byzantium, visiting the scattered Christian monasteries and hermitages and recording the rituals he saw and the preaching he heard in a book called The Spiritual Meadow. Unlike its predecessor, Dalrymple's account of his journey through the same regions leads, not to meditations upon the eternal God, but, rather, to insights into a dying culture. For whether among Surianis in eastern Turkey, Armenians in Syria and Israel, or Coptics in Egypt, Dalrymple finds only remnants of the Christian culture from which Moschos drew inspiration. The author cannot stop the often-violent persecution or the steady immigration, which are pushing Christianity to extinction in the land of its birth. Yet he can preserve the voices of the steadfast souls who guard the last sparks of a besieged faith. Thus, this book stands--like the chapels, monasteries, and tombs visited during the journey--as a monument to what once was. But Dalrymple also points the way to a better future by repeatedly stressing the similarities in origin and practice linking Christianity and Islam and by documenting real (though all too rare) instances in which mutual respect and tolerance bring the Muslim and the Christian together in prayer. Travel literature of real substance. Bryce Christensen --This text refers to an out of print or unavailable edition of this title. A memorable historical journey through the twilight of Eastern Christianity in the Middle East, heartfelt and beautifully told. Dalrymple (The City of Djinns: A Year in Delhi, 1994) has carved an unorthodox niche for an English travel writer: He is following in the 1,400-year-old path of an Orthodox monk. In 587, Friar John Moschos and a young student trekked across the Middle East, collecting precious relics and manuscripts from obscure monasteries, from present-day Turkey to Egypt. Dalrymples quest is similar; he is preserving the stories of the last generation of Orthodox Christians in the Middle East. Retracing Moschoss steps, Dalrymple finds once glorious Christian communities on the brink of extinction. One Turkish village that had 17 Syrian Orthodox churches now has only one [Christian] inhabitant, its elderly priest. In Turkey, Armenian Christianity has been more systematically erased, with cathedrals renovated into mosques, gravestones obliterated, and any mention of the Armenian presence in Turkey censored from publications, turning their existence into a historical myth. In one town, Dalrymple interviews a superannuated survivor of the Syrian Christian resistance of 1915, when Syrians witnessed the genocide of the Armenians and knew that they were next to be deported. Today, however, the descendants of Orthodox Christians in Turkey and elsewhere are emigrating as quickly as they can. Old churches stand abandoned or are employed for other purposes in Istanbul, for example, Dalrymple is denied entrance to a famous basilica because there is a Turkish beauty contest going on inside. Dalrymple is a talented writer, with a subtle wit, a keen eye for historical irony, and a relish for architectural detail. If his treatment of Eastern Orthodoxy is somewhat romantic, ignoring centuries of internecine conflict among various ethnic groups, it is understandable given his urgency to record the plight of this last generation of Orthodox practitioners in Muslim-dominated areas. An evensong for a dying civilization. (24 b&w and 8 color photos, not seen) -- Copyright ©1998, Kirkus Associates, LP. All rights reserved. -- This text refers to an out of print or unavailable edition of this title. From the Holy Mountain (hardcover) - Amazon's online bookstore.